At the opening reception for the Ozarks Studies Symposium in West Plains Thursday night, we were treated to a tour of the home of David and Sandy Evans. David is a judge in Howell County, and the house has been in his family for six generations. But it’s not just a museum-piece house. It’s a lived-in home that is constantly evolving. Here’s a cute touch: The Evanses let their kids and grandkids pick out a favorite book, and the spine of each book was then painted on the risers of the staircase that leads up to the children’s bedrooms and playrooms. At the top of the stairs is a little reading nook just the right size for a kid to snuggle into a beanbag chair and get lost. 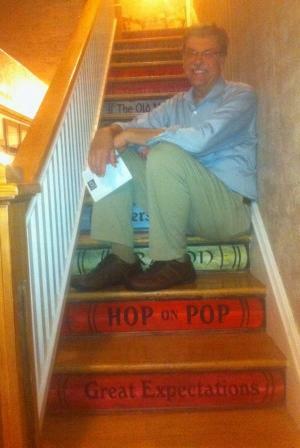 Here I am on top of “Hop on Pop” and “Great Expectations,” with “The Old Man and the Sea” over my shoulder.